AlteredBarbie is very excited to host artist Fred Rinne join the 2017 show. Painting in arylics, my work has shown mostly in the San Francisco Bay Area at ATA, The Lab, Intersection, Pharoah Maybelline and others. For the last decade I have produced hand-painted artist's books, which are in national and international collections. AlteredBarbie 2017: Super Heroine & Hero to the rescue Call to Artists EXTENDED August 30th! Read more about AlteredBarbie 2017: Super Heroine & Hero to the rescue Call to Artists EXTENDED August 30th! To all present, future & past AlteredBarbie & ChatterBox Arts International art collectors, supporters and artists. AlteredBarbie is back with a new show. 2017 is an expansion of the concept of icon. Please use your artistic license to expand upon Barbie into realms of the icon and super heroes & heroines of your preference. Looking forward to curating this show at Back to the Picture and working with all of you new and then some again! 2017 AlteredBarbie’s San Francisco Iconic Super Heroine & Hero to the Rescue exhibition. We the Artistic PEOPLE of San Francisco making it ALL Great Again !! What is The AlteredBarbie Exhibition? Hi All, check out this great video created by Jody Banks. 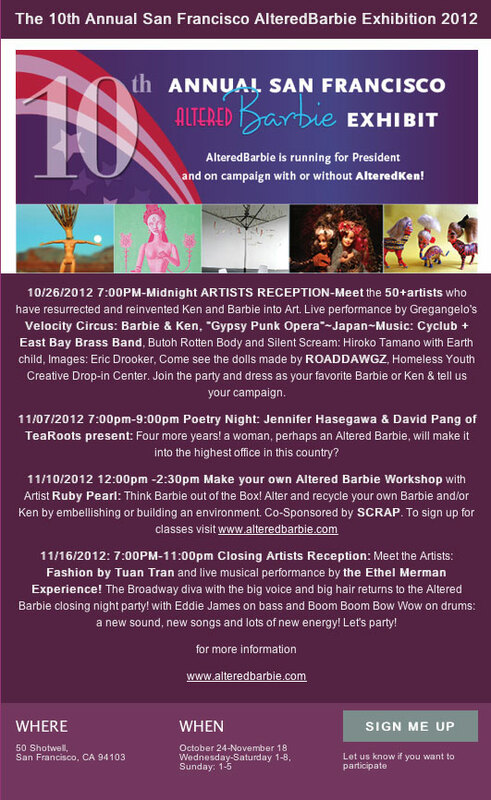 This will introduce you to some of the many AlteredBarbie artists who have participated and supported the show. Read more about What is The AlteredBarbie Exhibition? Included is a great link for interviews set up with John Hell at Radio Valencia. You can hear live / canned some of the voices that have been a part of the alteredbarbie show past and present. Have fun and thanks for staying tuned! Barbie would make an excellent candidate for President. It’s time for a qualified woman who can see both sides of the aisle to be a candidate. Barbie has been around the world and back and knows foreign policy; she appreciates and is aware of domestic issues, knows how to keep workers busy, find and increase jobs, and expand employment. She knows the great issues facing the country. She can solve many problems as she shows her ability to collaborate and find solutions to our current and future challenges. Four more years! Are we on the cusp of a groundbreaking moment – wherein a woman, perhaps an Altered Barbie, will make it into the highest office in this country? In all countries around the globe? Altered Barbie has a message and a platform and she's ready to combat, contradict, and co-mingle with the likes of Mitt and Barack, Hillary and Sarah, with or without, Ken! Submit 1-3 poems on the theme to alteredbarbie@gmail.com. Sean Manzano reading at the 2010 AlteredBarbie Poetry night. This is Sean Manzano leading the poetry reading at the 2010 AlteredBarbie Show. We are all looking forward to the 2011 AlteredBarbie Poetry Reading with you Sean! Thank you! Read more about Sean Manzano reading at the 2010 AlteredBarbie Poetry night. A wonderful Kickstarter Fun-Raiser is now available so anyone can support AlteredBarbie 2011. Thank you for supporting this local creative re-use show! Read more about Kickstarter FUN-RAISER Launched!! !